2 In 1851, Edward Hargraves found gold. The Rush was on! When? 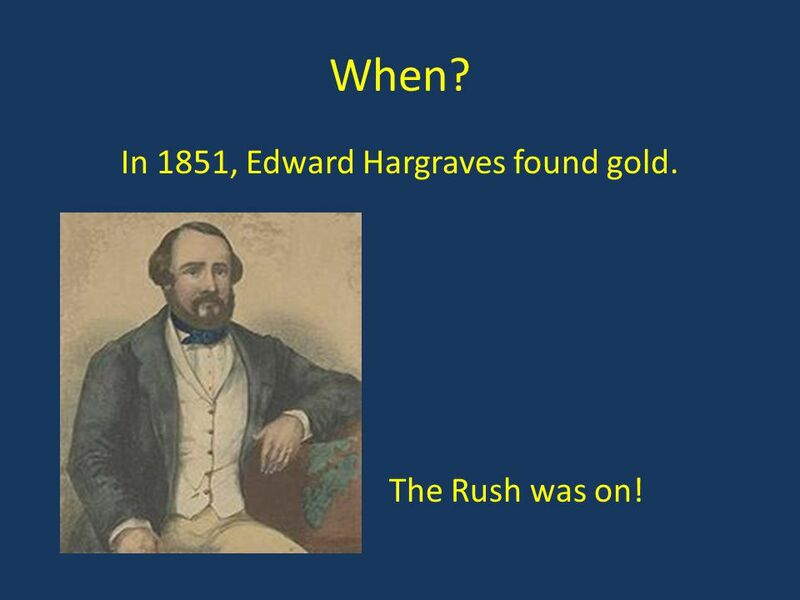 In 1851, Edward Hargraves found gold. The Rush was on! 3 How did it affect Australia? 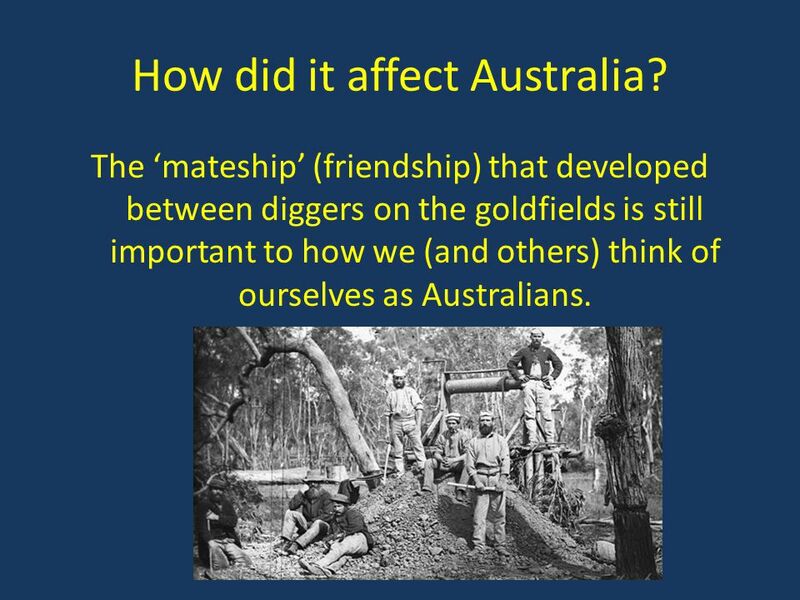 The ‘mateship’ (friendship) that developed between diggers on the goldfields is still important to how we (and others) think of ourselves as Australians. 4 Was the rush as good as it seemed? 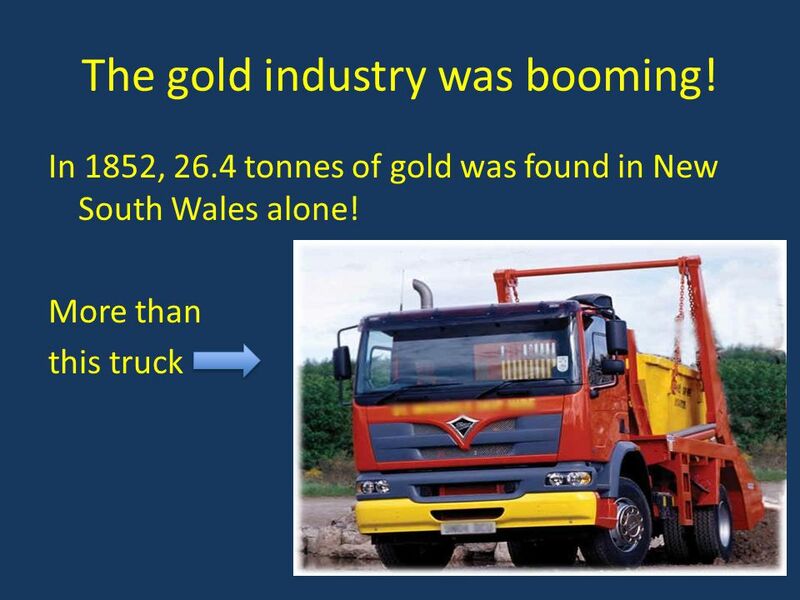 5 The gold industry was booming! 6 Stay in Victoria, gold diggers! 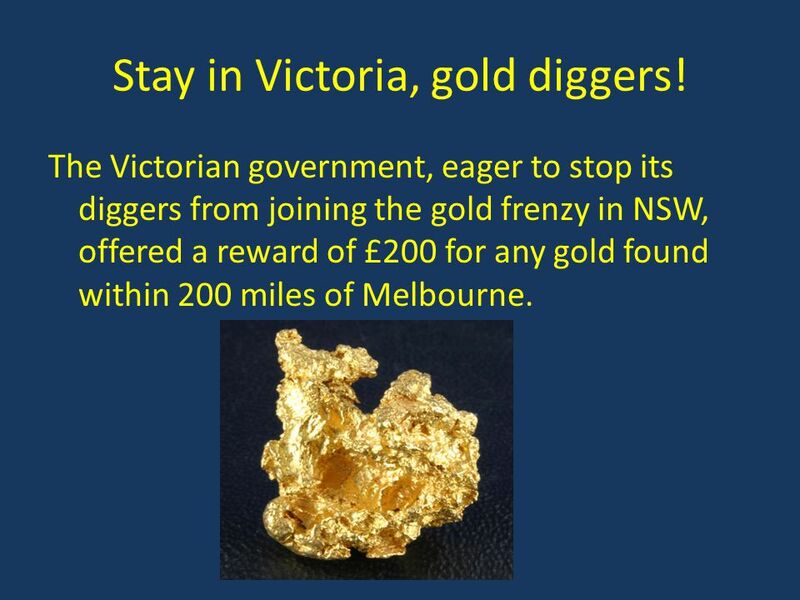 The Victorian government, eager to stop its diggers from joining the gold frenzy in NSW, offered a reward of £200 for any gold found within 200 miles of Melbourne. 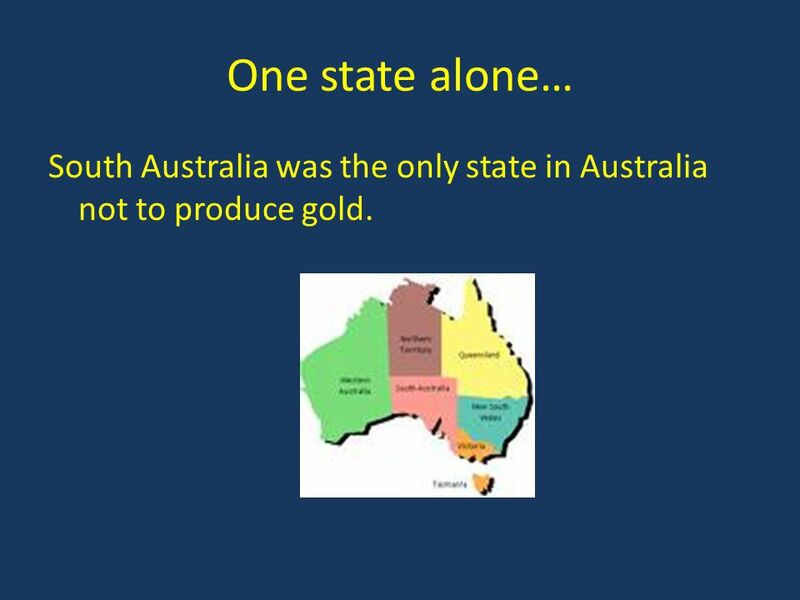 7 One state alone… South Australia was the only state in Australia not to produce gold. 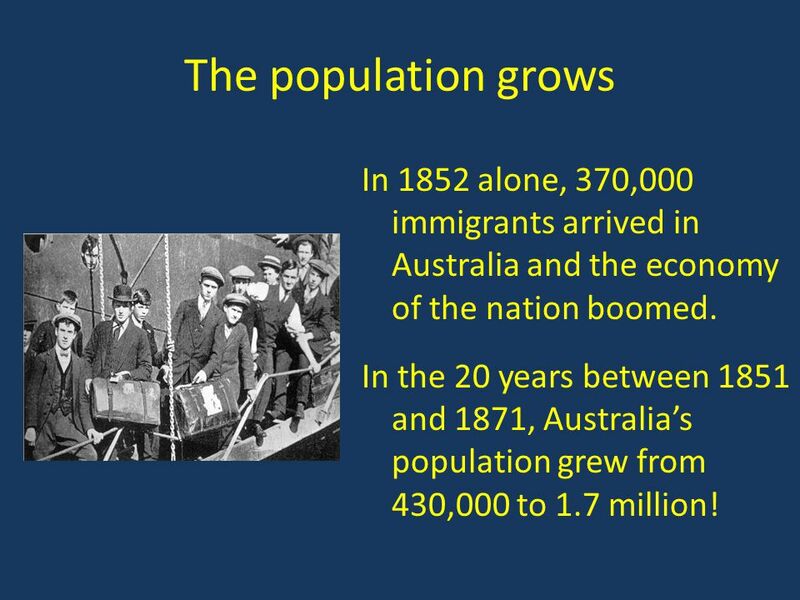 8 The population grows In 1852 alone, 370,000 immigrants arrived in Australia and the economy of the nation boomed. In the 20 years between 1851 and 1871, Australia’s population grew from 430,000 to 1.7 million! Australia attracted people from all around the world. Most of these new arrivals were British but also included Americans, French, Italian, German, Polish and Hungarian. 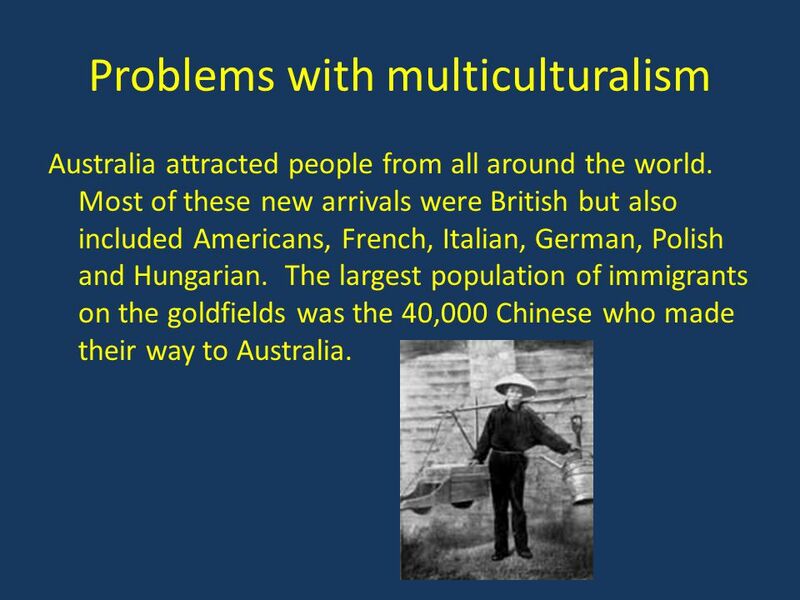 The largest population of immigrants on the goldfields was the 40,000 Chinese who made their way to Australia. Many people tried to get the Chinese on the goldfields to leave. 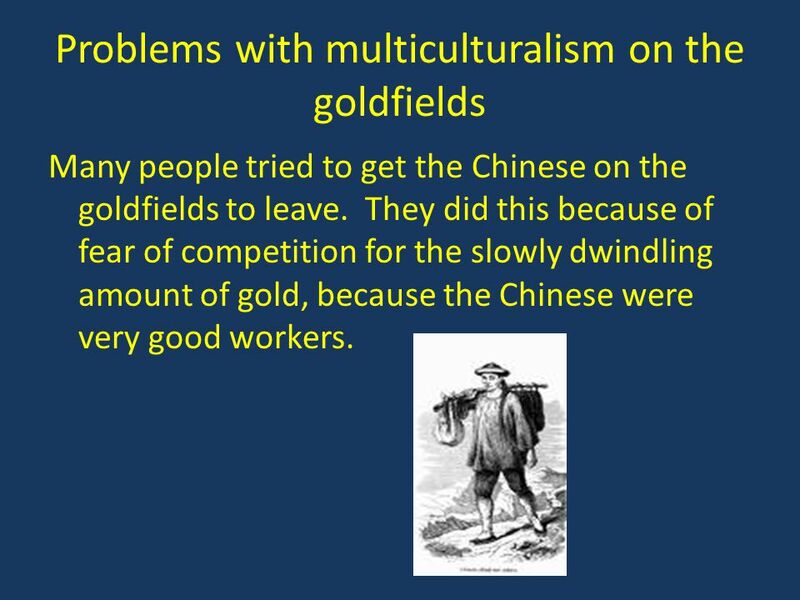 They did this because of fear of competition for the slowly dwindling amount of gold, because the Chinese were very good workers. 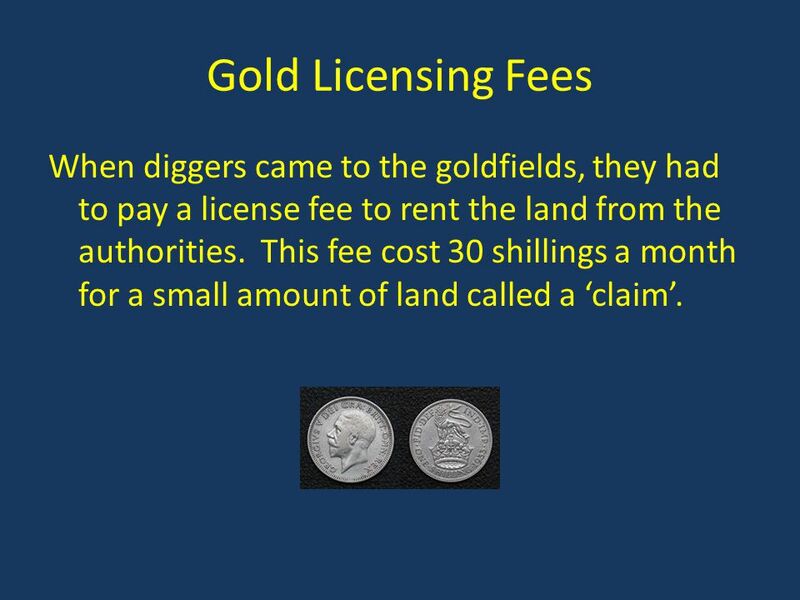 11 Gold Licensing Fees When diggers came to the goldfields, they had to pay a license fee to rent the land from the authorities. This fee cost 30 shillings a month for a small amount of land called a ‘claim’. 12 ‘Fox Hunts’ When a digger hadn’t paid his license fee for his land, he could be fined £5 for his first offence. 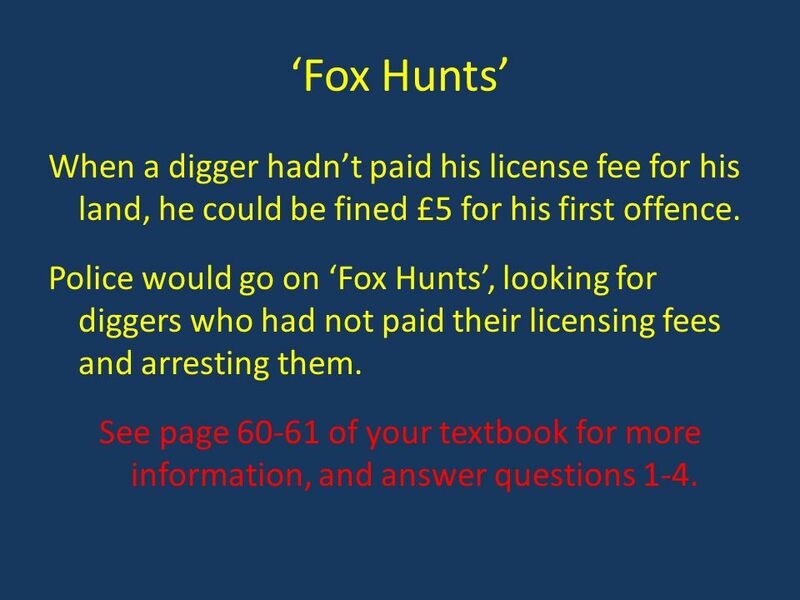 Police would go on ‘Fox Hunts’, looking for diggers who had not paid their licensing fees and arresting them. See page of your textbook for more information, and answer questions 1-4. 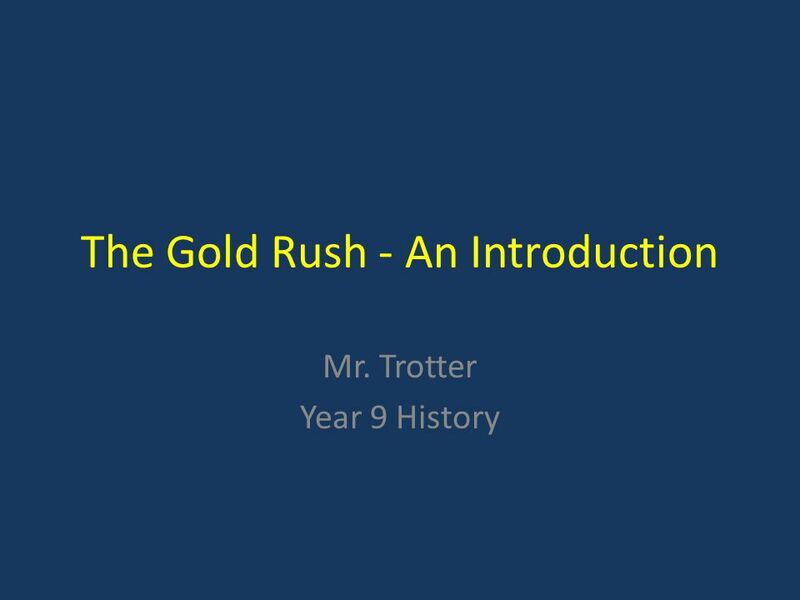 Download ppt "The Gold Rush - An Introduction"
Life on the Goldfields M y T i m e i n H i s t o r y Come and share my journey. Australia – Why have people moved there? James Marshall discovered a small gold nugget working outside of a nearby mill. At the worksite the next day there was an Indian shouting, Oro! (gold!). In 1851, after gold was discovered, the whole country caught gold fever. Men left their jobs, homes and families to join the rush to the goldfields. Discovery of gold and life on the gold fields during the 1850s. UIL SOCIAL STUDIES REVIEW Australia and Oceania. Australia is the ____ largest country in the world in land mass. 6 th. The Eureka Stockade By Jessica. In 1851 people from all corners of the world came to Ballarat in Victoria, Australia for the gold rush. People started. GOLD Eureka Flag, Ballarat Fine Art Gallery. Eureka stockade centre, 199? The Important Cities Of Australia. SYDNEY lies on the south-east coast the most populous city in Australia – 4,2 mil people area – km the capital. Immigration:  Up until the 1960s, Canada had a racist immigration policy:  Immigrants of British and northern European origin were preferred.  It was. 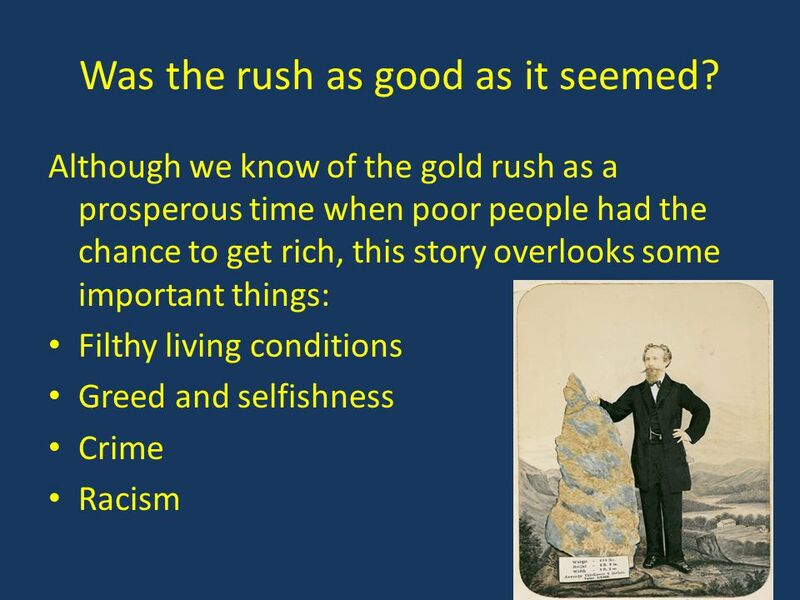 The Gold Rush By Niamh. The Gold Rush!!!! By Joshua. Horizons Ch. 6. The united colony of British Columbia was far from strong and had a weak economy: End of the gold rush Decline of the fur trade Population. Immigration: Immigration Immigration: When a person moves from one country to another. Push Factor: What pushes a person from a country. Pull. BRITISH COLUMBIA TO 1896 From the Gold Rush to the CPR. Australia’s Changing Food Influences Over Time. Created by Sarah and Marianne. The California Gold Rush. John Sutter Gold was found on his land.